Please follow us on Facebook from the link below for updates on route changes due to weather conditions, holiday schedules and any other changes in routes. Winter Reminder: Please scoop a place for your cans to be set near the road but not on the road. Cans will not be picked up from behind wind rows of snow and snow must be removed from in front and around dumpsters. Please remove cans from near roads and store them near your house when it’s not your scheduled pickup day. Thank You!! O.C. 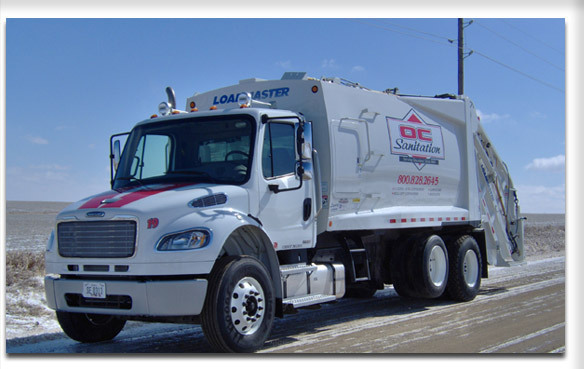 Sanitation Inc. is a family owned and operated waste removal company. Don Wielenga founded O.C. Sanitation, Inc. in 1968. Brad Wielenga and Sandy Wielenga-Albers now own and operate it. Don is still in the office every day to provide his viewpoints and experience. We have over 70 years of combined experience in waste removal services. O.C. Sanitation started with 1 truck and 18 customers and has grown to what we are today. We currently have 2 roll-off trucks, 5 rear-load garbage trucks, and 1 small mini-pack truck. We serve municipalities, commercial/business, industrial, residential and rural customers throughout the Siouxland area. We provide residential service, 95 gallon cart service, rear-load dumpsters, and open top roll-off containers and recycling. O.C. Sanitation provides prompt and courteous service. Our company and employees prides ourselves in the way we do business. We put our customers first. The service we provide is based on our customer's needs. This attitude is an important contributor to not only our success, but to the success and satisfaction of each customer we serve. We would like to have you as one of our valuable customers. In 2010 OC Sanitation added Portable Toilets to complete our waste removal services. We offer Daily, Weekly, or Monthly Rentals. Great for construction sites, special events or private parties. Please call our office regarding rental prices and services.